Dubai, UAE, January 29, 2019: At this year’s Arab Health (January 28 – 31, 2019) in Dubai, U.A.E., Siemens Healthineers is showcasing its products and solutions following the motto “We enable you to deliver high-value care”. All of the company’s innovations are designed to enable healthcare providers worldwide to increase value by empowering them on their journey towards expanding precision medicine, transforming care delivery, improving patient experience and digitalizing healthcare. With its long-standing presence in the Middle East and intelligent, forward-looking, and AI-powered solutions that capitalize on the ever-increasing volume of healthcare data and translate it into concrete clinical, operational, and financial wins, Siemens Healthineers is extraordinarily qualified as the trusted digitalization partner for the entire region. 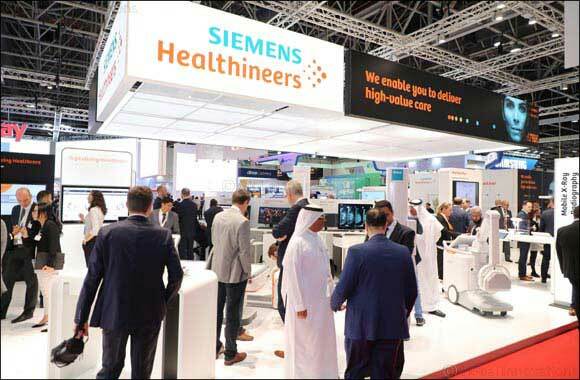 The company’s suite of AI-powered tools and digital offerings that are transforming care delivery is the centerpiece of Siemens Healthineers fair presence at Arab Health 2019 – including two new digital companions, the AI-Rad Companion Chest CT3 for radiology and the AI-Pathway Companion4 for support along clinical pathways. “The ability to collect and process large amounts of data has a huge impact on the whole healthcare system. In this digital transformation, we believe that industry knowledge and experience are crucial when turning data into actionable insights. Thanks to our close relations with healthcare professionals, we understand their challenges and needs. We systematically combine these insights with our in-depth knowledge in medical technology and data analytics to engineer solutions that help healthcare providers efficiently deliver the right treatment at the right time for every patient”, says Bernd Ohnesorge, President Europe, Middle East and Africa at Siemens Healthineers. AI-Rad Companion Chest CT3 is a software assistant that brings artificial intelligence (AI) to computed tomography (CT). Siemens Healthineers first intelligent software assistant for radiology – and the first application of the company’s new AI-Rad Companion platform – identifies anatomies and potentially disease-relevant changes. Teams of Siemens Healthineers scientists trained the underlying algorithms based on extensive clinical datasets. Using CT images of the thorax (chest), the software can differentiate between the various structures of the chest, highlight them individually, and mark and measure potential abnormalities. This applies equally to organs such as the heart and lungs, the aorta and the vertebral bodies. And the companion goes even one step further: The software automatically turns the findings into a quantitative report and thus helps increase productivity and quality in radiology. To expand precision medicine with artificial intelligence, Siemens Healthineers is presenting AI-Pathway Companion4 at Arab Health. It is a clinical decision support system based on artificial intelligence that supports physicians in making diagnostic and therapeutic decisions along the clinical pathway. While numerous applications in the healthcare market make the workflows of individual clinical or administrative departments more efficient, the AI-Pathway Companion is designed to help optimize the processes along clinical pathways and thus support personalized as well as standardized patient management. The AI-Pathway Companion can provide physicians in multi-disciplinary disease boards with the clinical status of each patient, based on data integration and artificial intelligence, and can make recommendations for next steps to accelerate diagnostic and treatment decisions. The Syngo Virtual Cockpit1 can be used by medical staff to connect remotely to scanner workplaces to assist personnel at a different location, especially where more sophisticated examinations are required. Syngo Virtual Cockpit can be utilized with CT and PET/CT scanners as well as with MRI and MR-PET systems from Siemens Healthineers. With the ability to deploy experienced technologists more flexibly across multiple locations healthcare providers can transform care delivery by improving access to healthcare and can easier achieve a higher level of standardization that leads to more accurate diagnoses by reducing unwanted variations in reports. Syngo.Breast Care5, the brand new version of the mammography reading and reporting software from Siemens Healthineers, provides physicians with an innovative type of AI-based interactive decision support6 for faster, more accurate interpretation of mammography images. While lesion and case scores6 provide accurate information on probability of breast cancer to support precision medicine, SmartSort technology6 reduces workload with automated case prioritization. This enables radiologists to deliver results within a shorter period of time, transforms their reading workflows and ultimately improves care delivery. In parallel to its suite of intelligent software solutions Siemens Healthineers is presenting its latest MRI portfolio at Arab Health, based entirely on the innovative BioMatrix Technology. By extending the availability of this technology, Siemens Healthineers is transforming care delivery in radiology and improving productivity while ensuring consistent quality. Scan results are therefore highly reproducible, enhanced through the integration of artificial intelligence. Magnetom Lumina7 (3 Tesla) and Magnetom Altea8 (1.5 Tesla) are the latest additions to the new portfolio of BioMatrix scanners and feature a 70-cm bore. In the 60-cm bore product segment, BioMatrix Technology is introduced to Magnetom Amira9. While strengthening its scanner portfolio, Siemens Healthineers substantially improves patient satisfaction in MRI exams with the revolutionary in-bore infotainment system Innovision2 that allows patients to watch their favorite show during a MRI exam. Available for all 70-cm bore systems, the innovation reduces the anxiety that can result in motion artifacts or even mean that the scan process has to be stopped. Innovision is designed to feature a mirror and a screen where movies and music can be played. A specially designed pillow transmits clear audio signals and attenuates scanner noise substantially. The planned display makes the inside of the scanner seem larger, which can be beneficial to patients suffering from claustrophobia. In the field of X-ray imaging Siemens Healthineers is showcasing for the first time at Arab Health Multix Impact10, its innovative floor-mounted radiography system that offers excellent value for money and makes access to high-quality imaging technology much easier. The intuitive to use operating system, the ergonomic design and modern wireless detectors used by the Multix Impact optimize clinical processes in radiography by improving both productivity and patient experience. Positioning camera and preconfigured organ programs allow even less experienced technicians to take accurate low-dose images. With Mobilett Elara Max10 Siemens Healthineers is setting new standards in mobile X-ray imaging. The easy-to-clean system design and surfaces with an antimicrobial coating reduce the risk of hospital acquired infections. A comprehensive IT security concept protects sensitive patient data and the secure integration of Mobilett Elara Max into the hospital’s IT environment provides access to all relevant data at any time. Thanks to the smooth maneuverability and flexible positioning of the X-ray arm, the system facilitates easy access to the patient and optimizes workflows in radiology, thus increasing efficiency. Through its consistently high image quality, it provides diagnostic confidence directly at the patient’s bedside.